Okay folks, time for the third installment of our tag-team episode-by-episode return to the Firefly series. Well, except for Tanzi, who’s watching the series for the first time. I repeat what ScottD said last time: we sorta hope that you watch each episode before you follow our discussions. But just in case you haven’t, we try our darnedest not to provide spoilers though it sometimes kills us not to talk about a particular bit in detail. We hope you appreciate our restraint and discretion and general thoughtfulness and nobility. ScottP: My number’s up for starting the post this time around. Although I’ve only seen the series all the way through one time, this is my third time watching “Bushwhacked” and I’m still not quite sure how I feel about it. It’s a good episode, don’t get me wrong, and it delivers some great bits, but for some reason it feels a little out of place to me, and I’m not even sure why. Maybe once ScottD and Tanzi post their thoughts I’ll get a little more insight into my own reaction to the episode. I almost hate to keep bangin’ the It’s-a-Western-in-space drum, but there’s no denying “Bushwhacked” is the episode where the crew of Serenity comes across what’s left of the wagon train after an ambush by hostile Indians — the Indians in this case being the mysterious Reavers, and the wagon train being a derelict spaceship. What’s funny about that is Tim Minear has said they deliberately kept the episode space-bound to avoid “the Western element,” which Fox hated. Tanzi: This is why it’s cool to have three different viewpoints for this one. I enjoyed this episode quite a bit, it was a nice self contained story that conveyed the threat of the Reavers without actually showing them and gave us some insight into how Serenity can operate in a system run by the Alliance. ScottD: Even this early in the series’ troubled run, they were evidently getting memos about production costs — they were being urged to do as many episodes as they could “on ship.” Though this episode does have two different ship sets besides Serenity, I guess it was still cheaper than doing a location shoot. But yep — we could easily brainstorm a dozen Western movies that start this way. ScottP: At any rate — Serenity finds a derelict drifting crazily, obviously in distress. When Simon questions Wash’s description of the ship as a “converted cargo hauler or short range scow,” Zoe explains that settlers pick them up cheap at government auction and retro-fit them to “make the one-way push to the outer planets.” Mal decides they should check out the ship for anyone in need of rescue and if they don’t find any survivors, salvage what they can. 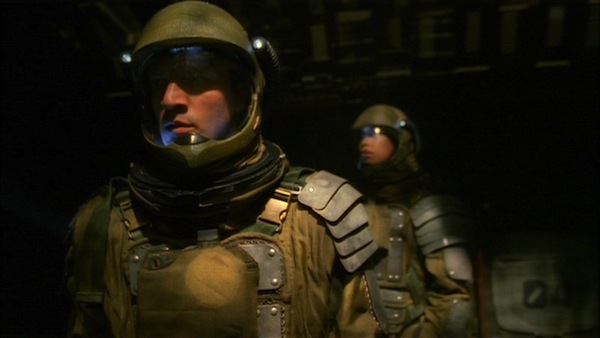 As the crew explores the derelict, the episode takes on a little of the feel of Alien, without ever seeming derivative. Tanzi: One thing I enjoyed about the initial scenes aboard the derelict was the lack of the Star Trek alien of the week with a prosthetic forehead. We get the expected ambush on the ship but it’s just a guy, not some stupid alien just for the sake of having an alien. ScottP: The sequence delivers a nice bit with Jayne playfully picking on Simon, too, and that pays off in an unexpected (and troublesome) way in a later episode. Tanzi: Funny you mention that because I thought that could have turned out to be a pretty deadly practical joke. But it’s true to character, Jayne can be a bit reckless. ScottD: This is the episode where we start to see the colonialism of the Firefly ‘verse. While the show is careful to avoid the word, perhaps because “settlers” sounds more Western and to avoid association with other franchises like Aliens or Battlestar Galactica, state-subsidized settlers are colonists. (Though interestingly, while they have “Alliance goods” to help them settle, they have to arrange their own transportation.) And in our history colonialism has involved factionalism between the sponsor countries, and also encouraged smuggling and piracy. Many a cash-poor beginning colony had to rely upon pirated goods purchased cheaply; it was not uncommon for merchants to collude with pirates to capture cargoes they themselves had ordered, to get them at a better price. The Fed captain uses the word “pirate” twice while interrogating Book. He also makes a reference to there being “40,000 of these ships” like Serenity to keep track of, perhaps a peeved exaggeration but giving us some idea of the scope of the under-the-radar smuggling trade. I envision the Firefly planetary system as being like the Caribbean islands of the 1700s, the “Golden Age of Piracy”, with lots of small ships coursing between them, many opportunities for smuggling/piracy, and many small islands to hide out on. ScottP: Not to keep referencing stuff in episodes we haven’t written about yet, but there’s a sequence in “Out of Gas” that really drives home the notion of there being a lot of pirates floating around out there in the black, too. ScottD: Joss Whedon has been quoted as saying that he envisioned Mal as being like Han Solo, and the Firefly stories being like Han’s smuggling adventures before he met up with Luke and Leia. Mal is a hard-working “honest” smuggler and salvager, but the Alliance sees pirates everywhere. Tanzi: We already know the Alliance are dicks but here we see just how petty they can be. I thought the right of salvage was an accepted maritime practice? The Alliance doesn’t agree apparently, they nicked the Serenity crew for “illegal salvage”. We also get some insight into how a crew of miscreants like the Serenity can operate: space is just too vast for the Alliance to be everywhere. They can’t possibly keep track of every ship. 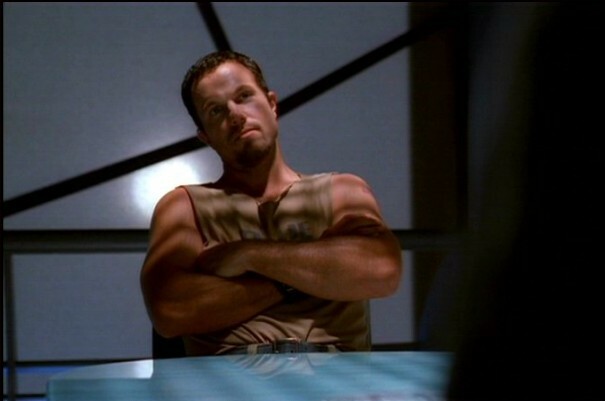 Even the news of an APB out for a brother and sister on board a Firefly class ship isn’t enough for the captain to order an immediate lockdown of the Serenity. It’s just another traffic stop as far as he’s concerned. ScottD: Like ScottP, I was faintly leery of this episode on my first few passes through the series; I tended to skip over it and watch another one first. But it’s grown on me, mostly because of the nice little insights we get into the crew when they’re being grilled by the Fed. I also really like the opener on this episode, the crew playing their energetic schoolyard ball game. (With the ball fashioned out of duct tape — nice touch.) Simon, River and Inara watch from above, each reacting characteristically: Inara amused but detached, River stimulated and trying to find patterns, Simon complaining that “they don’t seem to be playing by any civilized rules”. (He’s still trying to find something to cling to, after having all of the rules/assumptions he grew up with being yanked out from under him.) But Shepherd Book is right down there with the crew, playing and laughing and sweating. It is also a nice bit of good SF storytelling, the kind of attention to detail that I value this series for. One aspect of space travel that is seldom addressed (or deliberately overlooked to save screen time) is boredom. Space is big and it takes a while to cross it; the Firefly system may only take days or weeks between worlds instead of the months or years that our present technology would require, but there is still a lot of passage time. So folks do what they can to keep busy and let off steam. ScottD: Oh man, thanks for finding this image! This is one of the things I wanted to mention about this episode: the reminder that, when River isn’t making creepy oracular announcements like a witch out of Macbeth, she really is just an innocent kid who delights in the universe. But (sorry) to turn from the glory to the gory, this is the episode where we find out that the Reavers are not just campfire tales. And we have to ask: how does Mal know so much about Reavers? It’s starting to look like he has an almighty amount of practical experience with them, and it is also almighty clear that he is trying to suppress the memories that talking about them brings up. Personally, I have problems with the Reavers, and they are for me the weakest part of the whole series. On the one hand they make fine nasties: as ScottP mentioned, they are uber-Apaches (what’s worse, cannibalistic) always poised to swoop down and pick off the unwary, an enemy so terrible that they make Jayne blanch and can make Browncoats and Alliance temporary comrades against them. I mentioned before that one limiting factor on Firefly stories was the lack of aliens; Reavers are the ravening aliens of the old pulps, single-mindedly bent upon destroying every human they meet. But the storyteller in me, the science fiction writer who wants story elements to make sense, has a hard time working out a Reaver society. I think we are supposed to view them as wolf packs, picking off camps and chasing wagons — but wolves don’t have to maintain spacecraft. Reavers are presented as being so vicious, so chaotic, so insensible that it is hard for me to figure a way they could last for very long as an effective threat. ScottP: Yeah, the Reavers never really worked for me, either. They feel too much like a forced attempt at providing some kind of “space threat.” I had never thought about the fact that they don’t make much sense as a spacefaring tribe, though — and now they work even less well for me. If they’re as out-of-control ape-crazy as they’re played up to be, how the hell do they manage to get anything done? Tanzi: Hmm, I’m not one to pick nits on this kind of thing. You could make the same argument about Klingons. I’m sure there’s some fanwank retcon explanation about a Klingon science caste or something but you could say the same thing about Reavers. Maybe they kidnap engineers and force them to maintain the ships? Maybe they retain enough sense to do it themselves? Maybe in this universe it’s no more difficult than keeping an old car running. They’re just a convenient boogeyman, they don’t have to make sense for me to enjoy it. ScottP: See, I disagree about the comparison to the Klingons. There’s a difference between being a warrior race and being a bugnuts crazy bunch of self-mutilation junkies flying around with no core containment on their spaceships. And in a universe that’s as well thought-out as Whedon’s Firefly universe, the Reavers just don’t make any sense — they feel like an afterthought, thrown in simply to provide a convenient boogeyman, which, in my opinion, isn’t good enough. ScottD: During a Q&A at a con, I heard someone ask Joss Whedon if he was familiar with the history of the Reiver gangs that plagued the border between Scotland and England for hundreds of years. Whedon, deadpan, said, “Why, no — what an amazing coincidence!” Joss knows his history; he said his goal with Firefly was to mix the past and the future into a believable present. He’s also said that “the present is the past put through a blender”, which justifies the wide range of period styles in the show’s costuming. As ScottP said, this episode is so much a classic Western that it feels like a remake of an old script. The Alliance captain, new to the frontier and unwilling to accept the advice of an experienced local even as the Indians circle, is a classic Western trope — he might as well be wearing a clean new cavalry uniform, with Mal as the grizzled Indian scout. ScottP: And there’s another thing that hadn’t occurred to me, but yeah — the green Fed captain is right out of an old-school Western. Not that that’s a bad thing, mind you. Next week we’ll be taking a look at “Shindig” — don’t miss it!